Ceanothus 'Concha' is one of the oldest and best known hybrid ceanothus. This heavily blooming lilac averages 4' high by 4' wide, but can grow larger in milder climates. The deep blue flowers emerge from rose-colored buds giving it an overall lavender tinge for a while. It looks similar to the delightful Ceanothus ‘Dark star’ but seems to be less fussy and able to tolerate some supplemental summer water. It is drought tolerant, and generally garden tolerant. This is one of the few hybrids that are alkali tolerant. 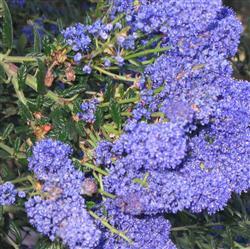 It is cold- hardy to 10 degrees F.
Ceanothus 'Concha' is believed to be a hybrid of Ceanothus papillosus var. roweanus and Ceanothus impressus and was introduced by Beeline Nursery way back in 1949. Bees love the brilliant flowers.